Amyloidogenecity of Epidermal proteins: Unfolding the mysteries. Amyloidogenecity of Epidermal proteins by Bell Raj Eapen is licensed under a Creative Commons Attribution-ShareAlike 3.0 Unported License. Our findings show that collagen, especially the alpha subunit of type VI collagen has many more amyloidogenic regions than keratin. The V324A mutation on KRT 5 did not change the amyloidogenecity of keratin. The role of collagen and fibroblasts in cutaneous amyloidosis has long been suspected. Amyloid reacts with anti-collagen antibodies along with anti-keratin antibodies, though both of these can be passive immuno-adsorption. These findings add credence to this theory, though further studies are required to conclusively prove the role of collagen in the pathogenesis of cutaneous amyloidogenesis. CA is known to be associated with friction and tractional force on the skin. 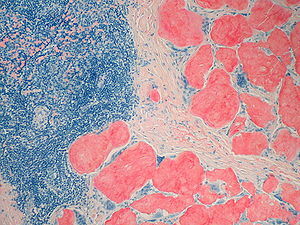 A rare diffuse form called Amyloidosis Cutis Dyschromica is supposed to be related to sun exposure. Type VI collagen is a ubiquitous microfibrillar collagen involved in cell adhesion. Hence it may get disrupted with sustained friction leading to amyloid formation. The 3 subunit of type VI collagen increases in the dermo-epidermal junction of photo damaged skin. This may explain the rare association with sun exposure. Cutaneous amyloidosis is associated with a rippled pattern of pigmentation. This cannot be explained by the optical properties of amyloid. The intraluminal fibrous striations in melanosomes, upon which melanin granules form, are structurally similar to amyloid. Hence amyloid deposits can act as a facade on which melanin granules can get deposited thereby preventing its elimination. That is probably why treatment strategies involving blockage of tyrosinase rarely improve pigmentation in cutaneous amyloidosis. The two treatment modalities available for cutaneous amyloidosis are DMSO and Colchicine. However the mechanism of action of both drugs in CA is not known. DMSO is known to cause dissolution of collagen. Colchicine is an inhibitor of collagen synthesis useful in scleroderma as well. Hence the beneficial effect of both these drugs on amyloidosis may be related to their effect on collagen.